Leiden physicist Milan Allan and his group have discovered an apparent paradox within a material that has zero electrical resistance. They report trapped charges, although charges should, in theory, keep flowing in the absence of resistance. The discovery could provide a missing piece of one of the big puzzles in physics today—high-temperature superconductivity. The results are published in Nature Physics. A material can either be insulating or conductive. In an insulator, an extra electron will get trapped. Thus, no electric current flows in insulators. In a conductor, extra electrons will immediately flow. The more conductive the material is, the faster the electrons will flow. The research group of Leiden physicist Milan Allan was therefore surprised to discover charge trapping in a material with zero resistance. Charge trapping is supposed to be a telltale sign of an insulator. 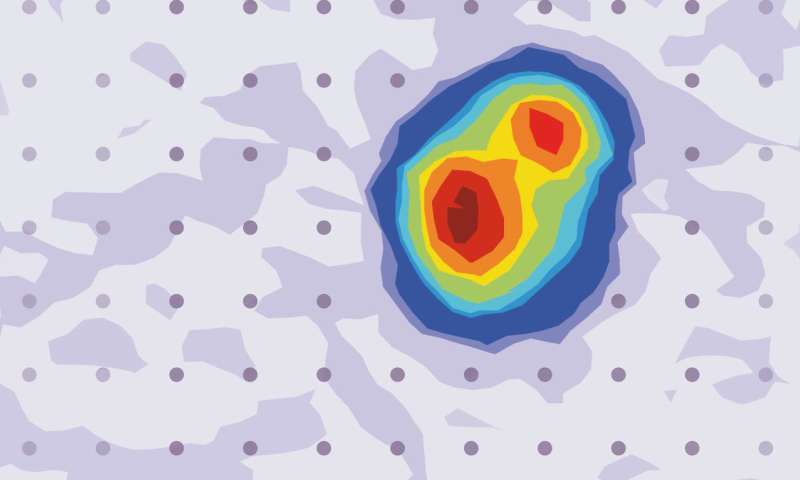 Together with Leiden theoretical physicist Jan Zaanen, Allan's group found that the phenomenon could unravel a longstanding mystery about charge transport in a family of materials called cuprates. These poorly understood materials have no resistance, even at relatively high temperatures, and are therefore labeled high-temperature superconductors. The mechanism behind those is one of the big mysteries in physics today. Ph.D. students Koen Bastiaans and Tjerk Benschop, together with postdoc Doohee Cho, spent two years building a new microscope. On top of measuring the average signal, it determines the fluctuations—usually called noise. These fluctuations indicated the trapping of electrons in the insulating layers of the layered material that the researchers studied, and which was grown by scientists from the University of Amsterdam. The microscope registers noise at the atomic scale, which was vital for the discovery. Bastiaans says, "The noise centers only appear in very few, localized spots, as if some atoms are noisier than others. Our microscope helps us to understand not only these materials, but also the noisy impurity spots themselves."